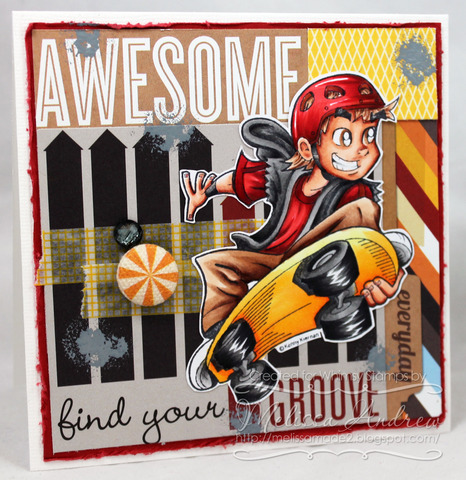 Hello and welcome to the Whimsy Stamps May Release Sneak Peak Blog Hop! Just as we did last month, we are now going to host a 3-day new release event each month where we will have a Sneak Peek Blog Hop on the day before the release (today! ), a Release Day Blog Hop on release day (tomorrow), and finally a Review Day Blog Hop the day after the release. Each blog hop has a prize of 2 new release stamps hidden somewhere along the way and you have 24hrs to enter each prize draw. Today we are excited to share sneak peeks of some of the brand new Wee Stamps, Kenny K and Momas Collection stamps that will be available to buy from the Whimsy Stamps store TOMORROW! To be entered into today's blog hop prize draw, be sure to leave a comment on ALL of the DT's posts listed below by 12.00PM EST tomorrow. All winners will be announced here on the Whimsy blog on Friday (26 April). For today’s card, I inked up KennyK's new rubber stamp Airborne! I had such a ball coloring this radical dude. And, you know, he's perfect for any BOY or Teen out there! Don’t forget to stop by the Whimsy blog again tomorrow for the full reveal of the new release and our New Release Blog Hop! This really is a great card for a teenager. The colors are cool and so are the sentiments and paper. Really nice job on your coloring skills. Great card. My 9 year old grandson Joseph is going to love this stamp! He loves anything with wheels! I am going to get this set along with some ink pads and markers so he can have fun with this! I can see him doing many pages in his scrapbooks with it. I know that he will also make us MANY cards and pages using this to thank us for getting it for him! He is such a kind and loving young man! He will be very happy with this! I am going to make sure he sees this post after we give him his gift! TFS! BTW- Great coloring skills! cute! Thanks for sharing with us! Awesome, that's the right word! Love the energy in this card! Fantastic card design and awesome colouring. Good job! Awesome coloring. Strong color are great for this design!! A great work and so funny,your coloring is adorable. for your inspiration,wish you a good evening. I am jealous of your awesome skills with making a masculine card, as that is not something at which I excel. I love your card. Great details. Fabulous card, Melissa! Great design and awesome coloring of the fun image! I love this sk8r boy. Fantastic masculine card. Love the distressing. Your colouring is just too awesome, congrats!! love the washi tape and the splatters of ink. bold vibrant coloring! Your coloring skills are excellent. You're right - it would be a great card for a boy. What a totally tubular, awesome card!! Your card is just so rad!! Great kid card. I am always looking for cards for boys. This is a great one! Very cute kid card!! Fantastic layout & coloring! wow this is gorgeous! He looks like he is jumping straight out of the card!!! a very cool card and beautifully coloured! Great card for a cool kid! This is amazing! Love the bright colors, and all the fabulous details! Totally awesome! I love your coloring on this super awesome image. The whole card is DYNAMITE! What a great card - just perfect for that skater dude. Fab new image and your colouring is fantastic, he really pops out at you! A great card and colours. What a great card! There is so much movement with that image!